A cashier was threatened at knifepoint in an armed robbery at a McColls store in Wiltshire on Saturday. 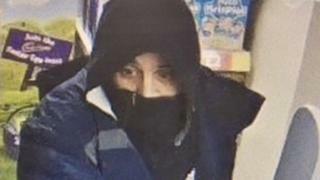 The man grabbed cash from the till drawer in the robbery in Dursley Road, Trowbridge, Wiltshire Police said. The force said the female member of staff was "very shaken up" by the incident at about 18.30 GMT. The offender is described as white, 5ft 4in (1.6m) tall and stocky. He was wearing a dark hooded top, and a dark scarf over his face. Det Con Matthew Smith urged anyone who was in the area to get in contact.